1. Was or was not Emanuel the husband of Violette & with whom did he live & how far did he reside from Mount Zion, the residence of Major Gordon. When Elizth L. Jones—first saw or heard of the petitioner Emanuel he was (or said to be) the property of a widow Routt—of North. Virginia whoes Daughter Catherine Routt—married William Claughton of said county—and Emanuel—the became the property of Mrs Claughton—whoes second marriage—was with one Captain Blackwell—and whom died shortly after sd marriage—(that is within twelve months—) in the Autumn of 1811—leaving two Daughters by her first marriage—and two infants by her last—Emanuel—was considered the property of the orphans above mention'd—But how that business was conducted—Elizth L. Jones does not know—and only adds—that Mr Blackwells— residence from Mount Sion was about 3 miles—where Emanuel lived during her life time. 2d. Did Major William Ball ever see or find Violette before the 9th July 1811? 3d. 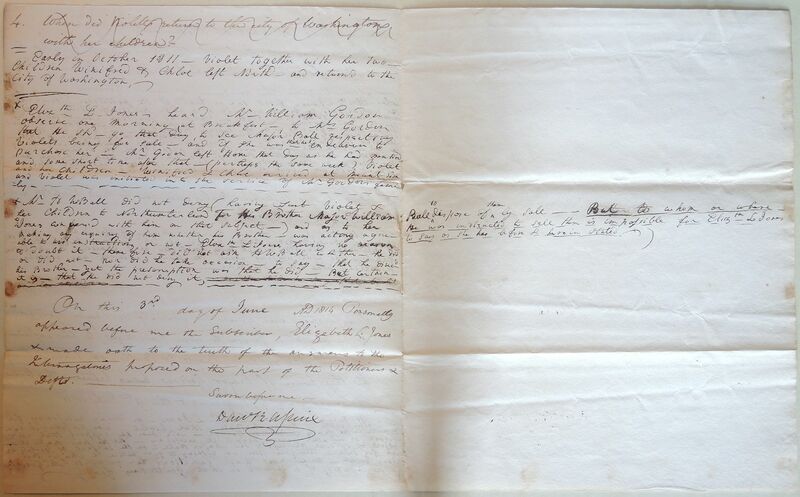 Was notice ever given by yourself of Major Gordon or by any other person to your knowledge to the defendant Henry W. Ball or to Major W Ball of Violette being at the house of Major Gordon being between the time of her coming to Virginia & the 9th July 1811. It never occur'd to Elizth L. Jones—as being necessary for her to give notice to Henry W. Ball—that Violet—was employed as a Domestic in the family of William Gordon—Nor does she suppose that Mr Gordon, or any other person deem'd it necessary—as he had made it an object of special business to see Major Ball—on the subject of Violets being for sale—Therefore there was nothing to give notice to Major Ball—about Violet—as he must have sanction'd her going to Mr. Gordons in the Capacity of a domestic in that gentlemans family. 4. When did Violetts return to the city of Washington with her children? Early in October 1811— Violet together with her two children Winifred & Chloe left North. and return'd to the City of Washington. 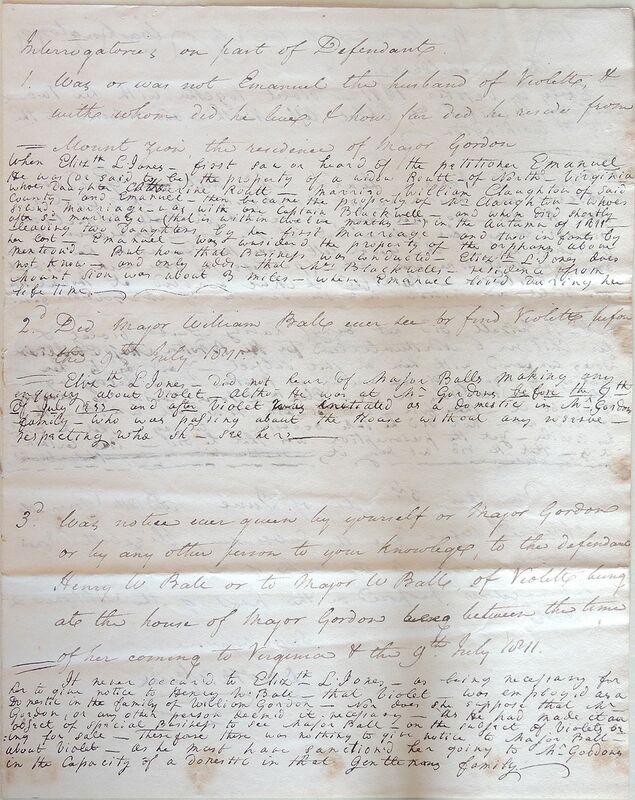 On this 3rd day of June AD 1814 Personally appeared before me the subscriber, Elizabeth L. Jones & made oath to the truth of the answers to the Interrogatories proposed on the part of the Petitioners Defts.